Play Blackjack with advanced casino options AND learn to count cards at the same time! Blackjack Expert teaches you card counting techniques while playing against the computer. 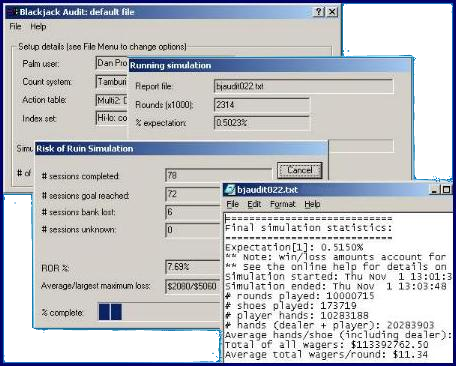 Blackjack Expert is a game simulator and testing tool combined in one easy-to-use program. As you play against the computer, your decisions are tested for correctness: actions, index plays, bet sizes, and insurance. The software comes with advanced casino options not seen in other Blackjack programs: splitting,number of decks, insurance, doubling after splits, dealer hits/stand on soft 17, ace re-splitting, and doubling limits. Whether you're just looking for a great Blackjack game or looking to learn or practice Card Counting techniques, Blackjack Expert is the fastest way to improve your game. Card Counting can give you a statistical edge over the casino so that you can actually make money playing Blackjack. Blackjack Expert is made to be used with Blackjack Counter, our advanced drillmaster and editor for Blackjack Card Counting systems. 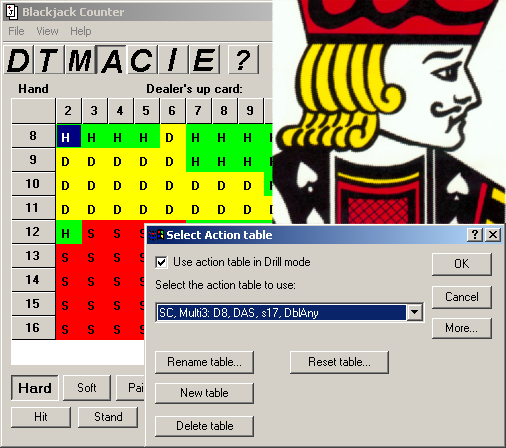 When both programs are installed, all of the count systems, action tables, and index sets in Blackjack Counter can be selected for testing in Blackjack Expert. This Windows version of Blackjack Expert can read the settings from either the Windows, Pocket PC, or Palm version of Blackjack Counter: only one version is required to be installed and registered.